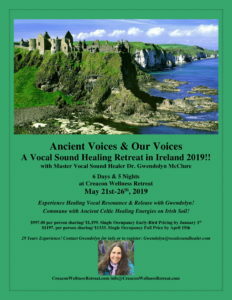 Ancient Voices & Our Voices A Vocal Sound Healing Retreat in Ireland 2019!! The Retreat price below includes a group Round-trip shuttle ride from Dublin Airport to Creacon Wellness Retreat. Individuals are responsible for Airfare, arriving in time to catch the group shuttle out of Dublin airport to County Wexford’s Creacon Wellness Retreat, optional healing treatments at Creacon Wellness, and personal purchases on the day excursion. The retreat price includes the shuttle fee for the day excursion. $997.00 per person sharing/ $1,199. Single Occupancy: EARLY BIRD by Jan. 1st 2019. Early bird price no longer available. These prices include the shuttle trip from Dublin airport to Creacon Wellness Classes other than Gwendolyn’s you choose to take at Creacon Wellness Retreats will be at your own cost. You are responsible for your own airfare to Dublin Airport. HOW DO I REGISTER FOR THIS VOCAL SOUND EXPERIENCE IN IRELAND!